A majority of veterinarians experience widespread moral distress when receiving inappropriate requests for euthanasia and in instances of being unable to provide care, according to a new study published in the Journal of Veterinary Internal Medicine. “A majority of respondents reported feeling conflict over what care is appropriate to provide. 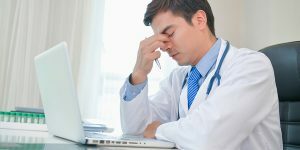 Over 70 per cent of respondents felt that the obstacles they faced that prevented them from providing appropriate care caused them or their staff moderate to severe distress,” the study reads. The study surveyed 889 veterinarians in North America about how they cope with ethical conflicts and moral standards with pet owners and caring for the animals. “My assumption is the findings from our survey are definitely part of, or even the majority of, the reason why veterinarians have higher-than-average suicide rates,” J. Wesley Boyd, the study’s senior author and bioethicist at Harvard Medical School, told NPR. The study revealed nearly 64 per cent of vets and their staff felt moderate to severe stress after getting inappropriate requests from owners to euthanize their pets. Another 69 per cent of respondents had moderate to severe amounts of distress of not being able to provide care to an animal they thought was appropriate.